I had a visitor at Baby Praise today. She is in student ministry at a church in Raleigh, but has been serving as a liaison for the children’s ministry for her church since the resignation of their children’s director. I realized after spending about on hour talking with Michelle that I came back to my office totally charged up about children’s ministry. I have noticed that this happens whenever I have the chance to talk about ministry with other leaders. I just get so excited! Sharing things I have learned over the years and hearing how other leaders do things makes my heart beat fast. Having lunch with a volunteer who “gets it” in relation to kid’s ministry makes my heart beat fast. Watching my coordinators interact with their teams makes my heart beat fast. Seeing kids excited to enter our ministry area and not ready to leave when it’s time to go home makes my heart beat fast. Walking down the hallway and hearing team members interacting with kids makes my heart beat fast. Visiting a church that I have been pouring into and hearing that something I suggested is working well makes my heart beat fast. Dreaming about the future of our children’s ministry makes my heart beat fast. I am passionate about children’s ministry – can you tell? 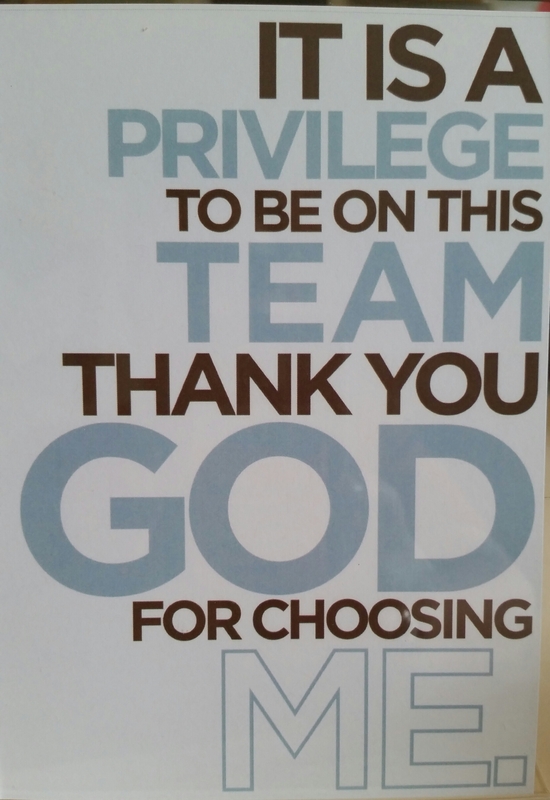 Everyone on staff was given a sign for our office that says – It is a PRIVILEGE to be on this team. THANK YOU GOD for choosing ME. I love that sign. Thank you God for choosing me to be a part of children’s ministry. It makes my heart beat fast.